Ischia Review celebrates Easter in Ischia by sharing some of the traditions of the island. We explain where and when the most important events take place and the history behind them. 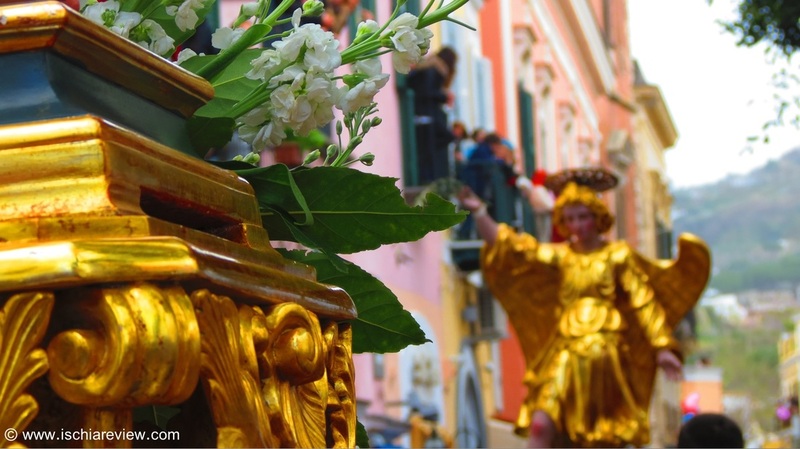 With Easter almost upon us, Ischia Review takes a look at some of the traditions associated with the Easter break in Ischia and in Italy. The Easter break in Ischia represents a significant period in the annual cycle of the island. Apart from the opportunity to mark the religious occasion with tributes to Jesus Christ and the Virgin Mary, the Easter holidays also signify the island’s re-awakening after the winter break when most hotels, thermal parks, gardens and wellness centres open their doors to visitors. Easter traditionally occurs around the beginning of spring-time and the sense of re-birth and regeneration is hugely poignant given the main reason for the holidays and the festivities that take place on the island. Of course, the most important aspect of Easter is the religious beliefs and traditions of Christians throughout the world. Easter marks the three day period during which Jesus Christ was taken to the cross to be crucified, only to be resurrected on the third day, and with Ischia and the rest of Italy being a country dominated religiously by Christianity, the tributes and festivities of the people are heartfelt. Easter in Ischia begins on Good Friday when the island marks the sombre occasion of Jesus’ crucifixion , otherwise known as “The Passion”, by recreating the horrific events of that day. The town of Forio plays host to the recreation of the Passion, with the events acted-out by local people playing the parts of the main protagonists of the story such as Pontius Pilate, the Roman Centurions and Jesus Christ himself. The actor playing the part of Jesus is led through the streets of Forio carrying a cross on his back, dressed in a purple robe and wearing a crown of thorns. During this time, Roman Centurions verbally abuse and whip Jesus as he makes his way towards the place of his crucifixion. The procession comes to an end at Chiesa del Soccorso where three crucifixes are erected, one for Jesus and another two for the two thieves who were crucified alongside him. The act faithfully follows the historical events of the Passion including the places where Jesus stopped to drink water, and as such the occasion is respectfully observed by the people of Ischia, central as it is to the beliefs of Christianity. The story of the Passion continues on Easter Sunday with another procession, called “La Corsa dell’Angelo”, where the people of Forio (as well as Lacco Ameno albeit on a slightly smaller scale), celebrate Jesus’ resurrection. The joyous occasion is marked by local people carrying statues of Jesus Christ, The Virgin Mary, The Golden Angel and Saint John as the events of the resurrection are re-created around the town centre. The climax of the story occurs when The Virgin Mary is re-united with her son, Jesus Christ, and the townsfolk mark the occasion by releasing doves into the air as well as petals and balloons from the houses looking down on to the streets. Easter Monday is a national holiday in Italy and is celebrated in a number of different ways. In Ischia, many people spend the day taking a picnic either on the beaches or in the mountain areas where there are special picnic areas set out for families to enjoy. Being Italy, no special occasion can be marked without a variety of delicious foods, made specially to celebrate Easter. Traditionally, Ischian families bake a cake called “La Pastiera” which is made from a wide-range of ingredients, and these cakes are made three or four at a time so that they can be exchanged with other family members. Picnics also include a “Casatiello”, a specialist bread containing a variety of cheeses, cooked meats and eggs, all washed down with locally-made Limoncello. A tradition shared by Ischia along with much of the western-world is that of exchanging chocolate eggs. The eggs are normally bought locally and exchanged between family members or by couples as a romantic gesture. Mini chocolate eggs are also used as a children’s game when parents hide them in different places around the house and challenge their children to find them so that they can eat them. 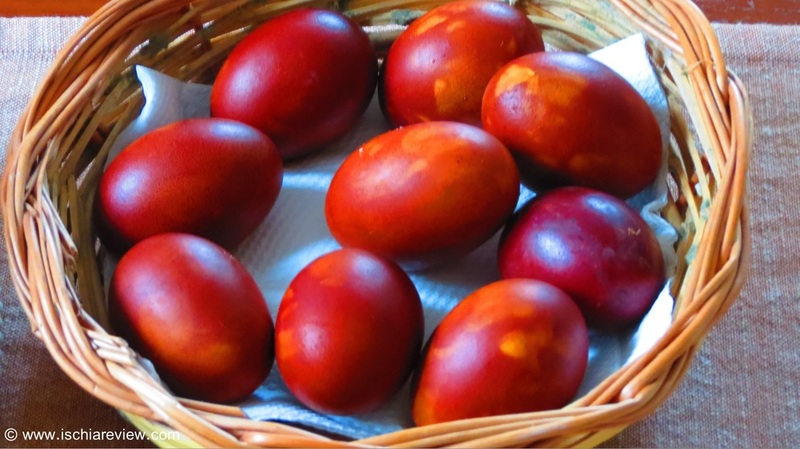 It is also possible to find real eggs that are brightly coloured being used either as decorations or as part of games where the eggs are boiled with roots of various colours and then left to go hard. The hard-boiled eggs are then used in a challenge to see which egg is the hardest, by knocking them against each other with the winner being the one that stays intact the longest. Easter in Ischia is an important religious occasion for the local people, but celebrated and marked in true Italian style with the family and of course, food being central to the plans. With the winter now over, Ischia begins to blossom once again and enjoy all the joys of Spring. As the island celebrates the resurrection of Jesus Christ, Ischia itself is also renewed and re-awakened as Italy’s Green Island once again prepares to welcome new and old friends alike. 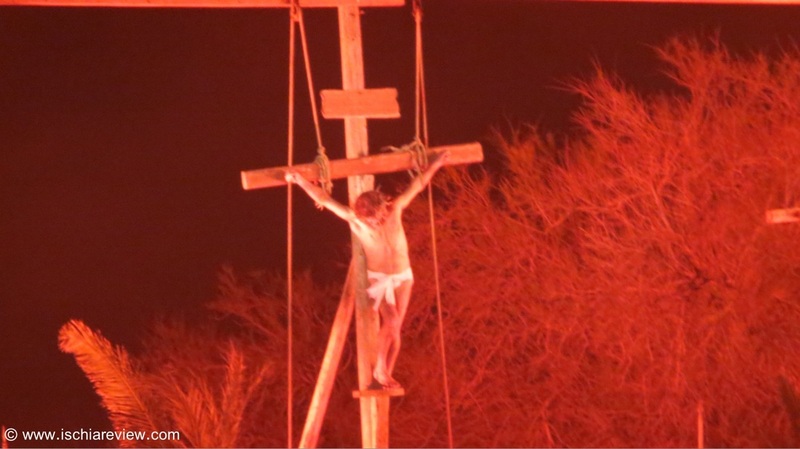 As a part of the Easter traditions in Ischia, the town of Forio transforms itself into a live theatre where the The Passion of Christ is played out on the town's streets. La Corsa dell'Angelo marks the occasion of the resurrection of Jesus Christ. Just two days after the heartfelt and dramatic Passion of Christ on the same streets.